The Most Reverend Plácido Rodríguez, C.M.F. retired as Bishop of the Diocese of Lubbock, Texas in October 2016. Bishop Plácido is 76 and has led the diocese since 1994. 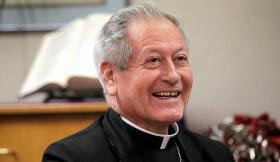 His successor, Bishop Robert M. Coerver, S.T.L., M.S. was appointed as the third Bishop for the diocese and was ordained a bishop during his installation Mass on November 21st, 2016 at Christ the King Cathedral in Lubbock. Bishop Emeritus Rodríguez, C.M.F. has returned to the Congregation as a member of the Claretian Missionaries USA-CANADA Province and resides with our Claretian community in Oak Park, Illinois.